What I did not expect was the adventure in what I can only refer to as Really. Slow. Food. With the attendance planned for less than 30 people and just three small courses, we started out pretty confident. One of the hardest parts of planning a local food event a month out is that you are really not sure if the menu you planned will match the food available. This approach is a whole lot easier in say, Southern California, rather than the Midwest where we have 90 degrees in mid-April then a frost warning the very next week. My usual approach of shopping the farmers market first, then making the dinner menu was not an option. You just can’t put off all the cooking to the afternoon before when you are planning on serving up to 35 people! Now, to request a couple vacation days from my full time job and get cooking. And be grateful my husband took some time off to help, too! He's been really supportive on these events and doesn't get the thanks or attention. Keep the menu flexible for last minute swaps or additions. Plan at least one dish that is based on an ingredient you know you can locally source, such as the meat or a year-round staple like eggs. Wash and boil the potatoes, skin on, until tender. Remove from water, and chill for two hours. Blanch the asparagus for three minutes and shock in ice water to stop the cooking and set the color. Whisk the dressing together. Chop the hard-boiled egg (or served halved). 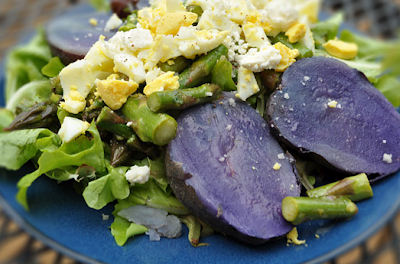 Assemble each of the four plates with greens, two potatoes sliced lengthwise, 1/4 of the asparagus, 1/4 of the egg. Drizzle with the lemon-mint dressing. Finish with coarse sea salt and black pepper if desired. Sprinkle on 1 tbs. of feta. Serves 8 small portions. Um, yes. But, where’s the adventure in that? Or the flavor. Or the variety. Still, the four trips to three different farms, a trip to the local butcher, and two farmers markets racked up the frequent buyer miles (but not nearly the average of 1500 for a single grocery store ingredient!). For our Slow Food board member (Jamie, you are amazing! ), it also meant doing some of the harvesting, too! The day was not without stress. After a call to the u-pick farm with asparagus, we learned they had over-picked for the day and our only option there would be to return and harvest the following day, but no guarantees of enough for our event. Sometimes things just don’t work out. These are real people and not some automated system, which is far more of a benefit than a problem. A quick call to a different farmer, and our menu was back on track. Sometimes local food is not the easy choice. It’s still the best choice. You can never know too many farmers. They call it Slow Food for a reason. Embrace the process. Whisk marinade ingredients together and place in sturdy zip lock bag with the flank steak. Marinade at least two hours, up to overnight. Chop the radishes and onions or garlic scapes finely. Chop herbs, add the radish and onion blend. Drizzle in oil and vinegar. Blend in salt and red pepper. Remove steaks from marinade and discard marinade. Grill over direct heat to desired doneness, depending on the thickness of the steaks, about 6 minutes per side for a 1-1/2 inch thick steak for medium-rare. Let rest for 10 minutes. Makes eight 4 oz. servings. One thing I wanted with the menu, other than including as many local ingredients as possible, being flexible, and make ahead (no small task) is to have a consistent flavor palate that would connect all the dishes. 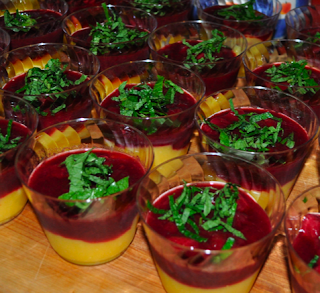 For that, we leveraged one local and abundant ingredient — mint — and the last of the winter citrus with lemons. Sure, citrus not local. It never will be local and neither is my morning coffee or my weakness for dark chocolate. For these items, it’s best to seek out US grown where possible, organic, and fair trade. By the fifth batch of lemon curd, we were pretty glad that it’s the end of citrus season. By the time we got the salad dressing done, the lemon rinds were building up. We compost everything we can, but here my spouse had heard that citrus acid slows the composting process. I had heard a few lemon rinds keep your disposal clean and working well. I am pretty sure neither bit of this advice was meant to cover forty lemon rinds. Working over the sink, I began to hear an odd sloshing sound. I looked down and was now standing in water with lemon pulp. The disposal double duty pretty well rattled the pipes apart. We had a flood under the sink, in the lower cabinet, on the floor, down into the basement wall. The good news is that when it comes to plumbing emergencies, there are far worse types of floods to have than lemon water. Plus, my husband is good with plumbing. We were left with half our pots and pans on the counters and a newly cleaned kitchen that needed drying out. Cooking was put on hold until the next day. This was the only moment in the process where I wondered if I could really make this happen, even with my husband's help and support. It was a good time to be grateful for simple menus. And friends who grill. Heading to bed, exhausted and smelling strongly of lemon, I made one desperate text to Craig Adcock. The response of yes was just what I needed to fall asleep. Still, Craig's good karma he earned from helping out didn't keep it from pouring rain the day of the event as he stood outside at the grill. The rain was at least good for the farmers. Forty lemons really should go in the compost. Craig Adcock is amazing for standing in the rain grilling. Combine wine, sugar, zest, lemon juice and vanilla in heavy large saucepan. Bring to boil, stirring until sugar dissolves. Add rhubarb and salt and simmer until wine syrup in saucepan until slightly thickened and reduced to 1 1/4 cups, about 10 minutes. Add the strawberries for the last few minutes, to cook slightly, but not turn to mush, add salt and a few grinds of black pepper. Cool and store in refrigerator. Whisk eggs and sugar, whisk in juice and zest. Place over simmering water (double boiler) until thickens, stir in butter. Whisk five more minutes. Remove from heat to a bowl. Cover surface with cling wrap and refrigerate to prevent skin forming. To serve, place lemon curd in a ramekin or glass dessert dish, spoon the compote over top. Garnish with mint leaves. Food got finished. Things were together, we made it, as in WE, not me. Because it was a team effort. And I hope everyone enjoyed the meal. As for me, when I was up talking about the joy of local food, I could look back at the kitchen and see my family, one of my best friends for over thirty years who came, and Craig, who is a friend I hope to still have in thirty years. That's what made the whole event worthwhile. I wouldn't trade local sourcing, for all its quirks, for any other way. At the end of the day, family, friends and sharing good food is what it's all about. It's good to have a spouse who loves to cook and puts up with the adventures. Urbavore Farm; eggs, mint, salad greens, herbs, radishes, spring garlic and the venue! Your hard work paid off -- that was a delicious meal! So happy to have the recipes. Thanks for sharing them. Thank you for coming! I'm glad you enjoyed the meal and the event. We loved preparing the food for you all.